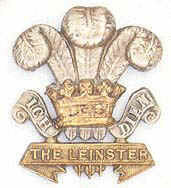 History of the 109th Regiment of Foot, 2nd Battalion the Prince of Wales's Leinster Regiment. Having been successful with the capture of Garrakota, the 3rd Bombay European Regiment returned to rejoin the 2nd Brigade at Saugor, there to recuperate before the next phase of the progress toward the 'rebel' stronghold Jhansi. During this 'R&R' period the 3rd Bombay European Regiment were permitted to experiment with a new battle uniform to replace the traditional heavy red and blue uniform worn by troops in England and the world over, wherever British forces were present. This new battle uniform was developed by the Regiment itself to create stone coloured cotton shirts and trousers. This was possibly the first time any British unit was permitted to wear a 'khaki' uniform. The experiment was deemed to have worked as the 3rd Bombay European Regiment from thenceforth became known as the "Brassheads" in recognition of the ability of the Regiment's ability to withstand the high temperatures of India. Respite was however short and late February found the 3rd Bombay European Regiment once more moving north with the 2nd Brigade toward Jhansi. Three more obstacles faced the 2nd Brigade before Jhansi., these being the strongholds of Narut, Dhamoni and Mundinpur. The 3rd Bombay European Regiment drew the attack on Mundinpur where the 2nd Brigade came under heavy attack. Once more, the Regiment under the command of Lt. Col. Liddell took the fight to their opponents beating back their foes from the hills overlooking the pass of Mundinpur and taking control of the area with a casualty list of only four men of the 3rd Bombay European Regiment wounded. Following a brief respite the 2nd Brigade continued on their route to Banpore and thence to the River Betwa where they encamped in temperatures of 105 degrees Fahrenheit (43 degrees C) on the 17th March 1858.